With Israel’s military withdrawal from Gaza in 2005, the number of tunnels mushroomed. The Israeli military used the tunnels as a pretext for stepping up demolitions of houses to make way for a buffer zone along the border. Israel’s main concern is the smuggling of weapons to armed Palestinian groups. But for the smugglers themselves there is far more to the tunnel trade than politics and arms smuggling. Everything moves through Rafah’s tunnels: from cigarettes and drugs to cash and people. It is a vast enterprise, and pays five times an average annual Gaza salary in one month. It is a family business, passed on from father to son and always – for reasons of security as well as economics – kept in the family. The tunnel trade is not merely a black market, it is a multi-million dollar, top-secret industry run with military-style efficiency, and one of the most lucrative businesses in Palestine. Even Israel’s Foreign Affairs website acknowledges “This industry comprises a primary source of income for entire families, and is the main source of income in the area.” What was once opportunism quickly became an established industry with market fluctuations, share holders and dividends like any other business. Out of necessity, a handful of prominent Rafah clans used their strong cross-border familial ties to achieve illicitly what politics otherwise makes impossible. Independent tunnelers exist, but creating and completing a tunnel requires not only experience, stamina, and the mental strength to stay underground for extended periods, but also financial capital. As a result, tunnels are usually financed by large clans or other groups with vested interests (even businessmen or government officials). The actual digging is often sub-contracted out to young diggers. Younger tunnelers hope one day to be able to “own” their own tunnel. The tunnel trade is a lucrative one, but with great risks involved. Houses are routinely demolished and shelled if Israel’s military suspects they harbor tunnels-even though their existence is often used as a pretext for Israeli military activity in the area. Then there is the danger that the tunnel, some of them 1.5 meters wide and up to a kilometer long, might collapse during construction or smuggling. Or being caught and detained on the Egyptian side of the border. 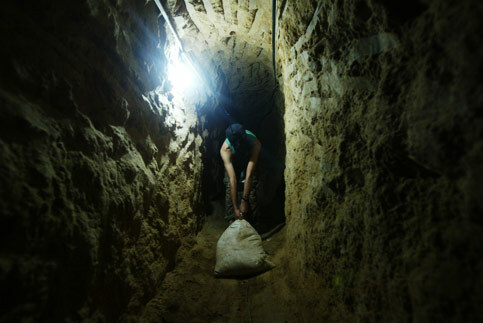 In October of 2006, the Israeli military was even authorized to use air force against tunnels or houses suspected of hiding them, and yet Rafah families go on building and smuggling. With Gaza’s economy in ruins and the strip almost completely isolated from the rest of the world, there are few alternatives. The tunnels also serve as a way for Palestinians to bypass and challenge the traditional boundaries of occupation, siege, and the Israeli “Matrix of Control”. They have even been able to transport Palestinian spouses separated from one another and unable to otherwise enter Gaza because they lack the proper Israeli-issued ID cards and permits. 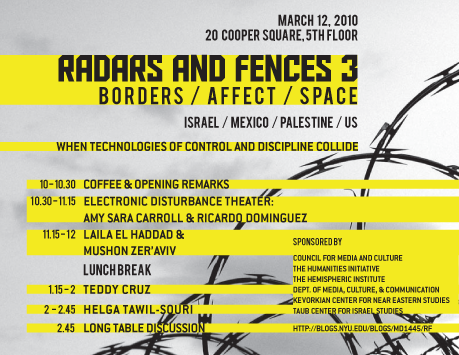 Such permits have traditionally been the tools used to control movement and residency and restrict access to and from the Occupied Palestinian Territories. But the Israeli occupation has also utilized far more overt and deadly tactics. While Kokhavi arrogantly presents the Israeli Army’s strategy of tearing through urban fabric of Palestinian life, it seems like the tunnel traders in Rafah, have themselves long departed from this traditional interpretation of space. While the critical discussion of urbanism in the West re-examines the city and attempts to expose the repressive invisible boundaries, in the occupied city it becomes an agent of repression. The city is not immune to the corruption of the occupation which is digging through walls and through the ground to posses and control any transfer of goods and ‘bads’. It seems the rules of urban theory breaks under occupation, when the ruler exerts both the visible and the invisible control mechanisms. The occupied city drives both sides of the conflict to challenge urbanism, but this non-traditional interpretation of urban space is not new to the Gaza strip. It runs back into history much further than contemporary cultural theory or the Israeli occupation. Tunnel digging has been a historic strategic tool in the region where ancient escape tunnels leading from forts and Churches led (sometimes for more than a kilometer) all the way to the sea. The tunnel proficiency has been used in the attack on an Israeli base outside the Gaza Strip. In summer 2006 several Palestinian gunmen popped out of the ground, attacked and killed several Israeli soldiers, and captured one of them, Gilad Shalit, through the tunnel and into Gaza. This sophisticated attack, reinterpreting the border, has left the Israeli society terrified. It has also played a major part in the lead up to the war in Lebanon the week after, when Israeli territorial sovereignty was breached again, this time on the Northern border. Our interpretation of space is to a large extent dominated by the fundamental human experience of gravity – walking freely on the earth. Yet, today, interpreting space in this ‘traditional manner’ is a luxury deprived of people under occupation. In Gaza, the ground is literally torn under your feet, and this fundamental point of spatial reference is lost. In January 2008 the Israeli siege on the Gaza strip have resulted in thousands of Palestinians, mainly women, tearing down the Rafah wall and removing the overground barrier between the Palestinian and Egyptian sides of the city. At the time of publication, parts of the wall are still down and the underground monopoly has been temporarily broken by civilian society, unbound, overground. *This article is based on The Tunnel Trade – a documentary Film by Laila El-Haddad and Saeed Taji Farouky, aired on Al Jazeera, September 2007. As a young mother I had this hope that my young ones would never have go the the army as peace was just around the corner. How naive I was. My hope now is that people would overcome their devastating need for being right, and will do the right thing instead. May all our grandchildren would grow up in peace. it is nice to be able share many things here… hopefully our post make the world better ..